Suzanne (Susie) Stamm Andrews is a lifetime resident of Carlisle, Pennsylvania. During her business career, she has always been a working artist, using various media and techniques such as painting, fabric and jewelry design. 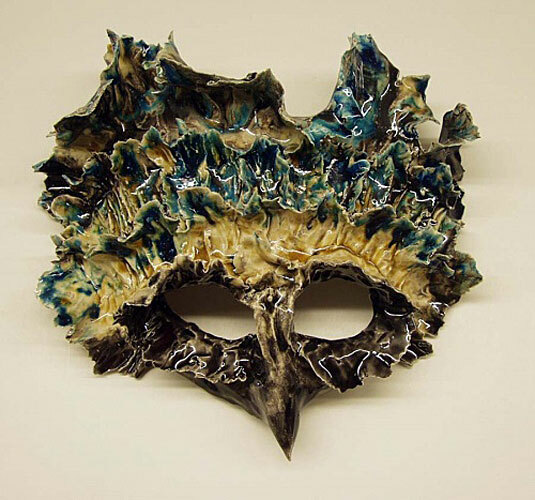 She first began working in clay while assisting in her husband’s clay classes in 1994. All of her work is hand built and one of a kind. In her early work, she began developing elegant and colorful forms influenced by her love of nature, flowers, whimsy and imagination. Her ability to work porcelain to such a seemingly delicate state would be remarkable in itself, if it were not for the fact that some of her works can achieve a very large size. Her designs range from bowl forms to wall hangings & masks, sculptural forms and finally figurines that we call “Critters,” and display great charm and humor. Many of Susie’s “Critters” have a seasonal theme to them from Halloween to Thanksgiving, Christmas, Valentines Day and Easter. Most works have multiple glazes on them, and many are multi-fired, in oxidation to cone 06 - 05, in an electric kiln. Westmoreland Arts & Heritage Festival in Greensburg, Pennsylvania. Lark Books (Asheville, North Carolina). • Susie is a featured artist in the video series “Masters of Arts & Crafts,” produced by ON-LINE Communications of Carlisle, Pennsylvania.